Take a look at this bathroom remodeling and renovation project in a house in LaSalle. You too can benefit from our expertise as a general contractor in residential renovation and our turnkey bathroom renovation services. Call us today for a free consultation! This bathroom renovation project aimed first and foremost at refurbishing the bathroom space. Our client wanted to give a new breath to this small bathroom with a more contemporary style and more accessible amenities. To achieve our client’s vision, we had to start by removing the vanity in decrepitude, in addition to removing the linoleum flooring. In addition, considering the age of the house, we had to refurbish the bathroom plumbing. We also modified the lighting by adding two ceiling lights, one of which was in the shower. Then, we added a ceramic floor covering. Subsequently, we opted for a shower with integrated bathtub, for its functional side. The shower includes a telephone shower head and a rain jet. The shower walls are made of white ceramic with a black and grey ceramic insert for a contrast effect. To maximize storage despite the size of the bathroom, our client chose a custom-made vanity with laminate flooring as well as melamine cabinets and drawers with a wood finish. As a general contractor specializing in bathroom renovation, we have established long-term partnerships with interior designers, cabinet and counter manufacturers, electricians, plumbers, etc. This approach allows us to carry out any bathroom renovation project, whether in a house, apartment, luxury house or duplex. 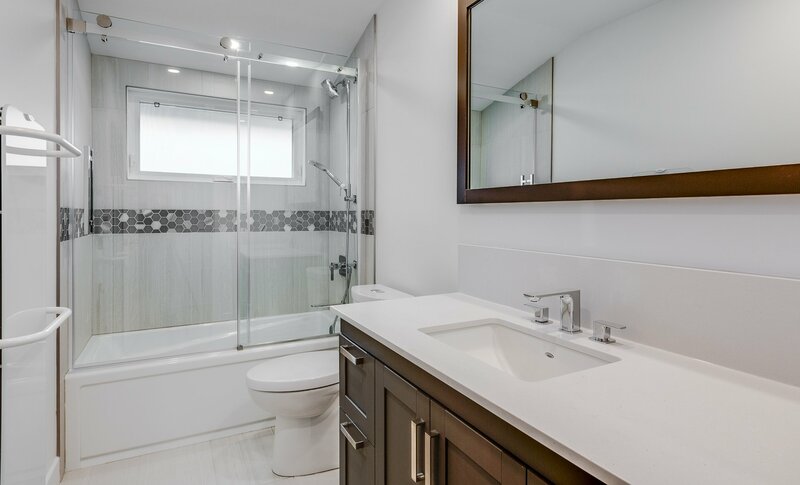 If you would like to know more about this bathroom renovation project in LaSalle, our turnkey residential renovation services, our prices, or our services, we invite you to contact us by email or by phone. Your first consultation is free of charge! Our team will be happy to welcome you and answer your questions.